May 24, 2017, 10:25 a.m.
By Joseph Lichterman @ylichterman May 24, 2017, 10:25 a.m. It was late April and the staff of the Coral Project was “on tenterhooks” as The Washington Post was conducting its first public test of Talk, the project’s new commenting platform, Andrew Losowsky recalled recently. The Washington Post — which launched the Coral Project along with The New York Times, Mozilla, and the Knight Foundation to improve communities around journalism — invited about 30 commenters who were active on its Capital Weather Gang blog to try out the platform and offer feedback. The callout attracted more than 130 comments, which included Post staffers probing commenters for more details and specifics, and additional reactions submitted through a form and email. The Post plans to make the Talk platform its primary on-site commenting system, and it’s now working to further integrate it into its site with plans “to launch as soon as is practical,” said Greg Barber, the Post’s director of digital news projects. The Coral Project, meanwhile, is taking that feedback from the Post’s users and integrating some of the changes they suggested into the platform. 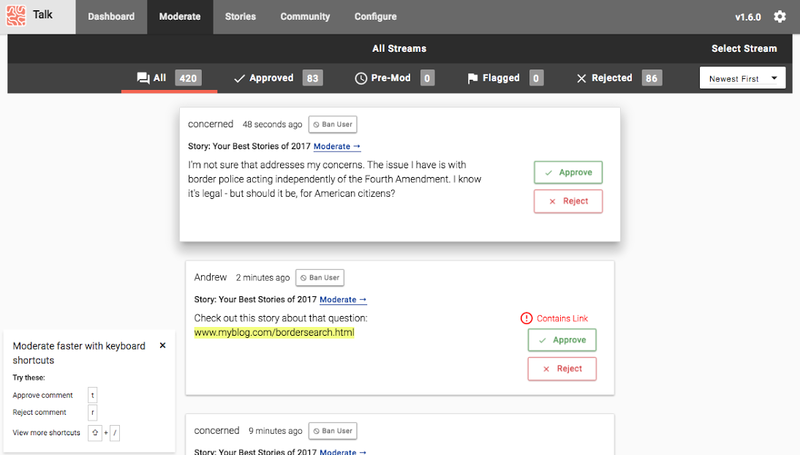 Along with Talk, Coral has also released Ask, a platform that enables newsrooms to ask specific questions of their audience, and it’s planning to release guides to journalism and engagement later this year. While the Post will be the first news organization to use the Talk system, the Coral Project is in talks with a number of other outlets who didn’t want to be among the earliest adopters, Losowsky said. Almost everybody online knows how to post something on Facebook or Twitter. The barriers to entry to being able to publish your thoughts online is [low]. As a result of that, news organizations need to think about what is the kind of dialogue they want to host versus the kind of dialogue that will appear elsewhere. I think it’s perfectly fine to say that there are rules here that are different from rules in other spaces, and if you want to do some other form of interaction, you can go and do it over there — but this is the kind of thing we’re looking for here. These are the baseline assumptions that we have here. Here are the things we’re trying to do with it. This is what this space is for versus that space. Being able to really define that, I think, is going to be really important. On the one hand, news organizations are not going to win in a battle with Facebook to create the best social network. But what news organizations can do is create a space which gives direct access to the journalists, that has the ability to bring the community into the process and be part of the process, manage interaction on the news organizations’ terms rather than Facebook’s terms about what is visible, what moderation tools you have, about the ability to focus and highlight on different conversations and so on. And news organizations can be transparent about how they’re using people’s data and really safeguard the privacy and transparency around the data of every interaction that they’re having with the community. On every article, news orgs using Talk can set an opening prompt at the top of the box to try guide the discussion and keep the conversation on-topic. Other features meant to facilitate productive discussions include the ability to add context to reports of inappropriate comments, banned words that are automatically rejected and suspect words that are flagged for moderation, and badges for staff members so they’re easily identifiable. 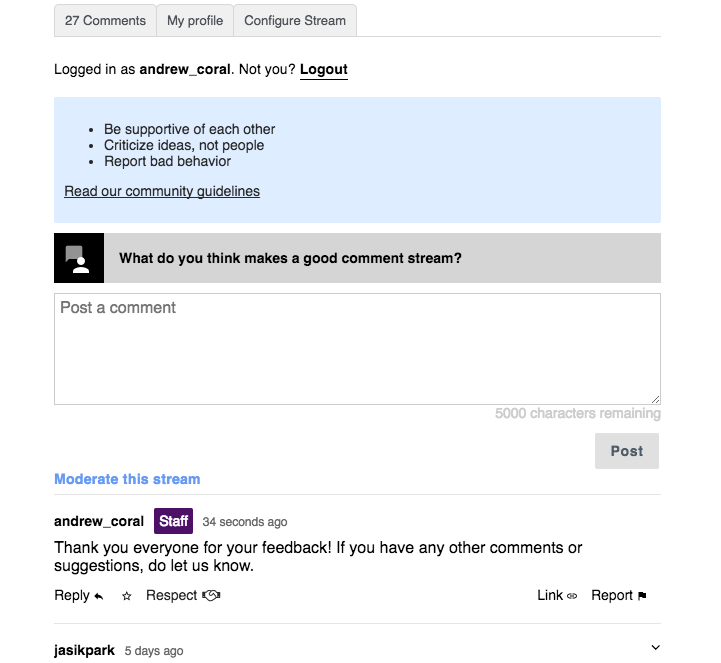 Outlets can also personalize the way users can respond to comments. The default, based on research from the Engaging News Project, is a “respect” button instead of a “like” button. 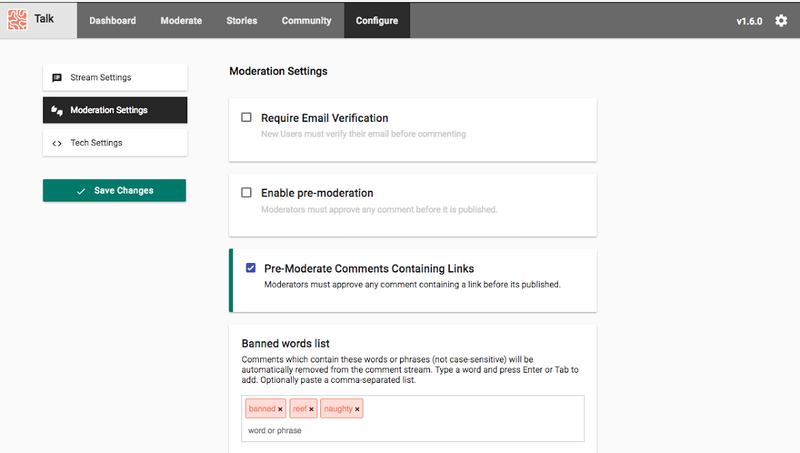 Moderators are able to ban users directly from the comment, and the moderation dashboard automatically highlights banned and suspect words. They can also pin their favorite comments at the top of the feed, to highlight the best comments and also set the tone for the conversation. Talk, like everything The Coral Project has produced, is open source, so outlets can build upon it as they like and the entire Talk system is built around plugins, with the idea that publishers can tailor the system to their needs. The Coral Project also offers hosting services, which could be useful for smaller newsrooms. For its part, the Post has been conducting quality assurance testing and also making sure the code in Talk doesn’t interfere with any of the other Post’s services. It was also tested on the Post’s development and staging servers to make sure everything worked properly before it was rolled out to users. Barber said the test in late April was unusual because the Post conducted it before it was able to hook Talk up to its own authentication system, which is one of the ways that it’s customizing the platform to hook up to its infrastructure. The Post is also connecting Talk to the systems it uses to monitor its servers and hooking it into its CMS so comment streams can automatically be created for stories. The Coral Project team is also working on adding new features based on the feedback it received from Post commenters who tested out Talk last month. 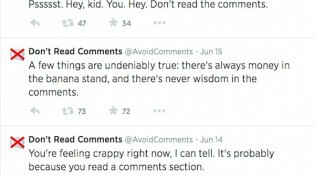 The current Post commenting system, for instance, allows readers to edit comments. 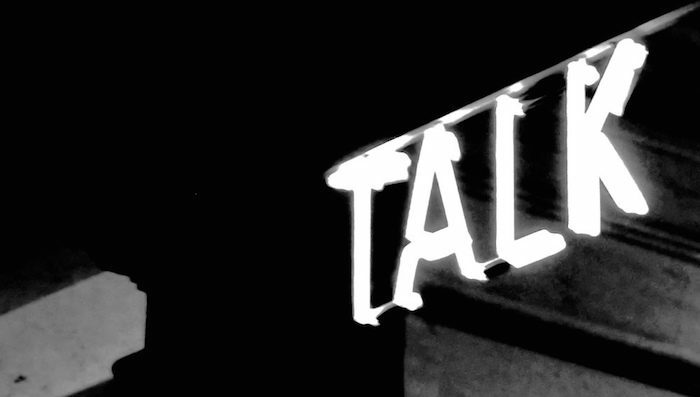 Talk didn’t. They’re now working on adding an edit feature to Talk. Outlets will be able to set a time limit for — maybe five or 10 seconds — for commenters to read over their post and edit it before it goes live. Barber and Teddy Amenabar, the Post’s comments editor, were active in the comments for the test last month, thanking users for feedback and asking questions such as “Anything missing that you’d like to see in a new system?” They collected that feedback and created a spreadsheet with the information that they then shared with the Coral Project. The Coral Project plans to take that feedback and continue to build out Talk while also looking for ways to help news organizations develop their engagement strategies and define what kind of conversations they want to host on their own platforms. Photo by Philipp used under a Creative Commons license. POSTED May 24, 2017, 10:25 a.m.
Lichterman, Joseph. "How The Washington Post plans to use Talk, The Coral Project’s new commenting platform." Nieman Journalism Lab. Nieman Foundation for Journalism at Harvard, 24 May. 2017. Web. 18 Apr. 2019. Lichterman, Joseph. "How The Washington Post plans to use Talk, The Coral Project’s new commenting platform." Nieman Journalism Lab. Last modified May 24, 2017. Accessed April 18, 2019. https://www.niemanlab.org/2017/05/how-the-washington-post-plans-to-use-talk-the-coral-projects-new-commenting-platform/. Is Mailchimp ready to dive back into podcasts in a big way? The latest round in the eternal fight over social media boundaries.